Spiralized Food is So Much More Fun To Eat! In at least some fashion, we’ve all been conditioned to want to eat beautiful food. That’s part of the reason why “junk food” is so appealing. The beautiful shapes, colors, and packaging makes it so much more fun to eat. But what if you can experience the same excitement and goodness eating foods that are actually good for your soul. Beautifully prepared dishes that leave you feeling fully satisfied and happy inside. When you spiralize a zucchini, for example, it’s no longer just a boring vegetable. Now it’s a beautiful, cool, exciting zucchini that tastes so much better. It’s weird to explain, since at the end of the day, it’s still a zucchini. But the satisfaction of eating the zucchini in fun shapes, digestible bite-sizes, and a whole new eating experience makes it so much more fun to eat! If you’re like most parents, getting your kids to eat vegetables is a daily struggle. You may be surprised at the positive effect spiralizing vegetables together with your kids has on the outcome. Let your kids have a turn spinning the Spiral Cutter handle, and then let them touch and play with some of the cool vegetable noodles after. Tell them you are making “magic spaghetti” with those cool shapes you guys created together. Odds are, they will be far more willing to eat the zucchini— especially if there is a delicious sauce and fresh cheese on top. Delish! Are you looking to incorporate more vegetables into your daily food intake. If so, congratulations! That’s a fast way to improve your health, confidence, complexion, energy, and overall mood. And what’s even better is our Spiralizer makes cooking veggies a breeze. When you spiralize your veggies, it takes seconds. Perfect for making beautiful salads, veggies toppings, or healthy snacks. And spriralized veggies actually make cooking times much faster! Cooking for Your Family has Never Been This Enjoyable! There are so many creative ways to cook using our premium Spiralizer. 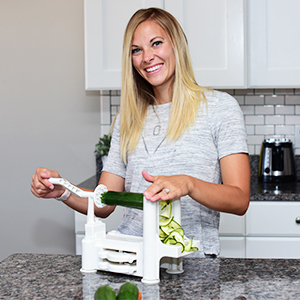 Our Spiral Slicer makes it so convenient to cook for Keto and Low Carb Diets, Paleo, Vegan, and Gluten-Free lifestyles. You will love thinking of new ways to replace favorite recipes with spiralized vegetables instead. 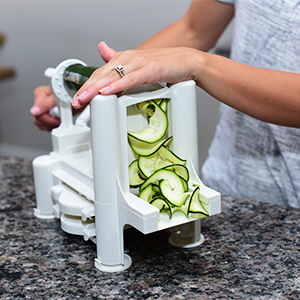 And let’s be honest, there is no denying how fun it is to use our Spiralizer. Don’t be surprised with your husband and kids fight over wanting a turn spinning the handle. Now you can get your whole family excited and involved cooking healthy together in the kitchen! If you a looking for a special and thoughtful gift idea, then you may want to consider our luxurious Spiralizer for all your favorite people. 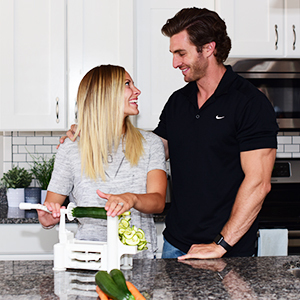 Most people want to add a bit more fruit and vegetables into their life, and what could be better than using our Spiral Cutter to accomplish that goal. Your friend may even turn into a Spiralizer addict— it’s been known to happen before. And they’ll have you to thank for introducing them to a better way to get healthy! 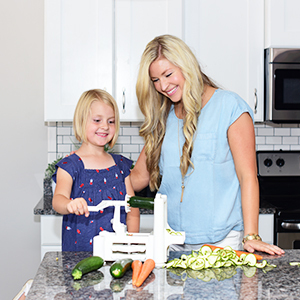 Our heavy-duty vegetable spiral slicer was created with you in mind. The 5 different Japanese stainless steel cutting blades are strong enough to spiralize even the toughest fruits and veggies, like sweet potatoes, squash, and ginger root. 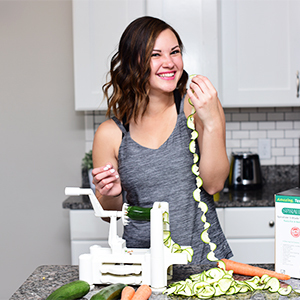 You will wonder how you ever got along without your Spiralizer! With our high-end design, cleaning is a breeze with our Spiralizer. You can wash it in your dishwasher, or you can easily wash it with soap and water. There are no electrical pieces, so no need to worry about submerging it under water. It weighs 2 pounds, and the product dimensions are 12.6 x 6.7 x 9.5 inches. It’s just the right size to store in a cupboard or drawer when you’re not using it. Or you can proudly display it on your counter. It makes a great conversation piece, for sure! If you are looking to cook a healthy meal within seconds, than you will love our deluxe Spiralizer. Half the battle of healthy eating, is the amount of time it traditionally takes to slice and prepare fruits and vegetables. We’ve taken the hassle out of slicing, dicing, and chopping and streamlined it into one easy step. Get ready-to-eat and ready-to-cook fruit and vegetable pasta and noodles within a minute. Just secure the veggie into position, and then spin away. Voila! Gorgeously cut fruit and vegetables within a minute. NEVER GET BORED ON A KETO/LOW CARB, PALEO, RAW, VEGAN, OR GLUTEN-FREE DIET AGAIN – Start Making Healthy Gourmet Meals As Soon As You Get It – You’ll get an excellent recipe e-book filled with nutritious, mouth-watering meal ideas the whole family will love! RAVING FANS! – Our product has been seen on bethenny, Ellen, The Doctors, the Food Network, national newspapers and magazines throughout the country and if that’s not enough, read the thousands of reviews left by amazing Amazon customers. WHY DO I NEED THIS? – Enjoy your meals even if you are on a diet (raw, vegan, low carb, gluten-free, no wheat, Paleo). Replace high carb pasta with veggie pasta. A Perfect Gift for All Occasions: What is better than the gift of health? LIFETIME REPLACEMENT – You are covered by Spiralizer’s lifetime no-hassle replacement policy.